Welcome to the new searchable online database for the art collections held by Aberystwyth University School of Art Museum. 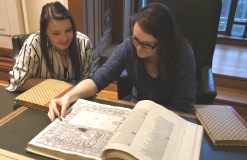 There has been a University Museum Collection at Aberystwyth since its foundation in 1872. Aberystwyth University School of Art Gallery & Museum now keeps collections collections of fine and decorative art of both national and international significance: prints, drawings and watercolours, paintings, photographs, ceramics and decorative art from the 15th century to present day. Simple and advanced searches have been designed to allow you to explore the collections. This catalogue presently focuses on our paintings, drawings, prints, photographs and watercolours. For further information about works in the Collection, to arrange a study visit, or for details about image licensing, please contact museum@aber.ac.uk. This site is currently under development and testing. New text and images are added regularly, software continues to be refined, and the site’s functionalities assessed. Thank you for your understanding and patience. Of international importance, our Ceramic Collection may also be accessed online. Please note that we cannot provide valuations for works of art. We only value the work in our collections for insurance purposes and this information is confidential.